Zion Market Research has published a new report titled “Plumbing Fixtures Market by Product (Toilet, Sink, Showers, Bathtub, and Others), by Material (Plastics, Metal, and Vitreous China), by Application (Residential [Renovated and New building] and Commercial) - Global Industry Perspective, Comprehensive Analysis and Forecast, 2017 – 2024’’. 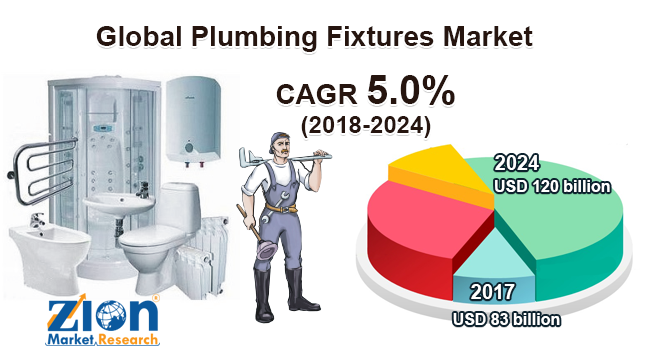 According to the report, global plumbing fixtures market was valued at around USD 83 billion in 2017 and is expected to reach approximately USD 120 billion in 2024, growing at a CAGR of slightly above 5.0% between 2018 and 2024. Plumbing fittings & fixtures are vital components of the plumbing system that are installed in buildings for effective water distribution in activities such as removal of waterborne wastes, washing, and drinking. Previously, conventional plumbing fixtures were installed owing to its easy availability and affordability. Currently, producers are focusing on utilization and development of electronically-based fixtures. Nowadays, most of the public commercial areas such as hotels, malls, and showrooms have sensor-based urinals with minimal moving parts. This extends the life of the urinals along with reducing its wear and tear. Sensor-operated valves help in reducing water consumption through intelligent flushing based on fuzzy logic. Growing investment in smart buildings and homes, rise in disposable income, and investment in infrastructure facilities are anticipated to propel plumbing fixtures market during the forecast period. Furthermore, escalating construction activities, especially in Asian countries will strengthen the demand for the product. Introduction to the innovative water efficient systems has given lucrative opportunities to plumbing fixtures market. Rising urbanization along with the builders and homeowners extensively adopting the plumbing fixtures increases the demand for the plumbing fixtures market. As per United Nations, in 2014, nearly 54% of the global population resided in urban areas and 2.5 billion are anticipated to be added till 2050. With more people migrating to the urban area, they are anticipated to opt for newer facilities including luxury plumbing fixtures for the bathrooms and kitchens. Global plumbing fixtures market is expected to grow at a significant rate owing to customer’s willingness to spend upon home renovations and construction activities. Increasing spending on premium quality fixtures such as faucets and showerheads along with bathroom renovations will support global plumbing fixtures market during the forecast period. With rising disposable income of customers, they are more likely to spend on luxury and aesthetic products. In 2015, India’s annual GDP growth was 7.3% and Bangladesh was 6.3% as compared to 6.1% in 2014. High GDP growth of these regions is expected to offer exponential growth to global plumbing fixtures market till 2024. However, there are certain factors that can hinder the growth of global plumbing fixtures market over the time. Such as raw materials prices and availability are anticipated to fluctuate over the time. The product must comply with standardization and certification to ensure security and safety. Furthermore, stringent regulations pertaining to quality of the material such as nickel, tin, and lead used in kitchen and bathroom is projected to restrain global plumbing fixtures growth. Global plumbing fixtures market is categorized on the basis of the product as a toilet, sink, showers, bathtub, and others. Bathtubs are driving the industry growth as there is an increasing demand for rejuvenation centers and spa that are supporting the product demand. Various applications pertaining to global plumbing fixtures market are residential and commercial. Rising trend of smart homes with cleaning area for kitchenware will support the demand for efficient fixtures in residential applications. Furthermore, rising preference for aesthetically appealing and efficient faucet providing long life will drive the industry. On the basis of material, global plumbing fixtures market is categorized into plastics, metal, and vitreous China. Vitreous China is anticipated to register significant gains during the forecast period in the global plumbing fixtures market due to its aesthetic appeal and longer shelf life. Europe will witness significant gains over the forecast time period in global plumbing fixtures market. The growth is attributed to increasing number of commercial spaces such as offices, shopping malls, and certain industrial facilities. Global key producers in the global plumbing fixtures market are MAAX Bath Inc., Elkay Manufacturing Company, Roca Sanitario, S.A., TOTO Ltd., Fortune Brands Home & Security, Inc., LIXIL Group Corporation, Masco Corporation, Jacuzzi Inc., Kohler Co., and Geberit AG.